“I’m inspired constantly by what I see,” Lauri Twitchell says. For the past 30 years, Twitchell has been making one-of-a-kind books that incorporate stones, wood, and other objects from the natural world. Twitchell’s work has been purchased by libraries across the country, and a handful of her creations live in UC Berkeley’s Environmental Design Library. 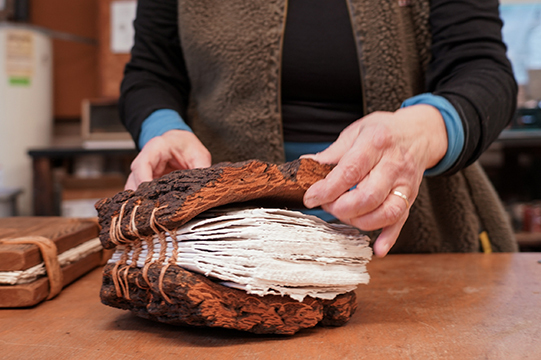 They are among the 300 artists’ books, acquired through endowments, housed there. “Her work really pushes the boundaries of what constitutes a book,” Environmental Design Librarian David Eifler says. The artists’ books are not just sights to behold — they’re instructional tools, too. Regular events allow students and community members to get a closer look at — and even touch — the works, which are often held in locked cases. And Eifler wheels a cart carrying a selection of the books into introduction-level environmental design classes to help spur a thought-provoking dialog about art, design, and the value — and definition — of a book. “It’s amazing what (the students) see and find in them,” Eifler says. Then there’s 2016’s Sticks and Stones. The stunning volume — with covers of curved redwood bark — was inspired by a hike she went on with her husband, shortly after undergoing back surgery. Twitchell traced objects she found on the ground — including sticks and leaves — on handmade Indian paper. Inlaid within the outlines, spanning continuously across the folded pages’ peaks and valleys — along with flat stones affixed to the pages — are cutout fragments of old Baedeker maps, representing the “places I have been or I will go,” according to Twitchell. Both books were made in collaboration with fellow artist Peter Suchecki. 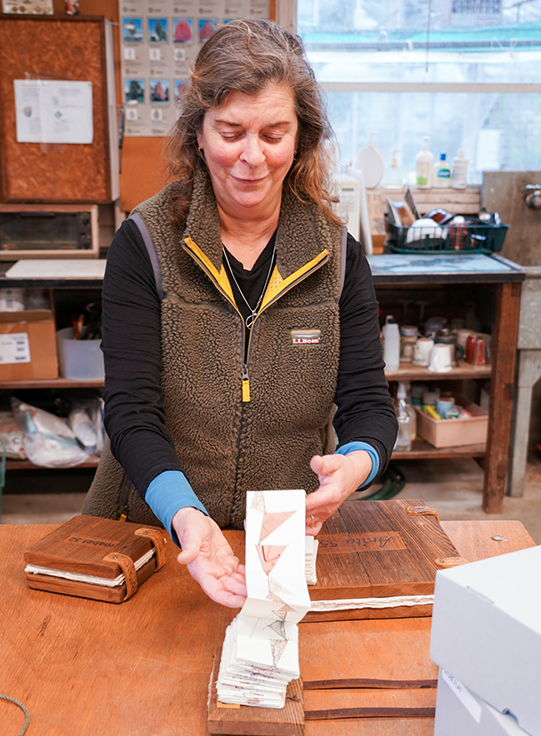 Twitchell, who also leads bookmaking workshops, estimates she has made nearly 100 such works, which take anywhere from three days to several months to finish. Of her books, which is her favorite? “The next one,” she quips. 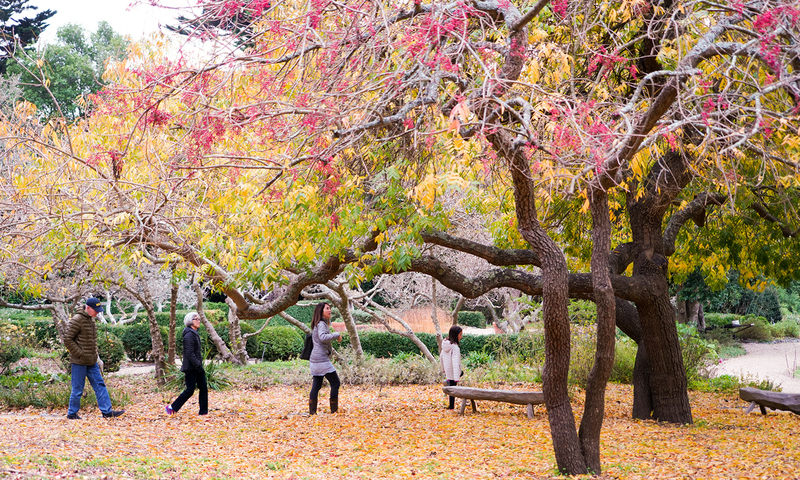 Visitors wander around the trees in Blake Garden in December. 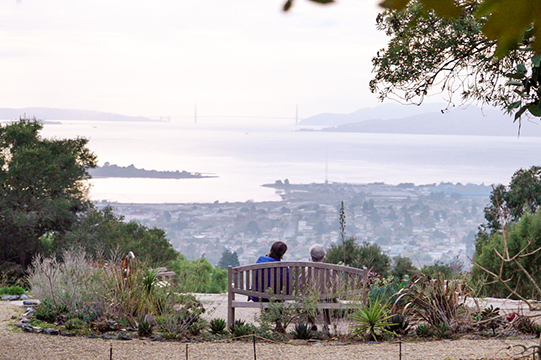 Blake Garden is a landscape laboratory and public garden owned by UC Berkeley.